Fresh off my obsession with the musical Hamilton, I decided to check out the show Dear Evan Hansen. As I am a poor woman who doesn’t live anywhere near Broadway, I did this by listening to the soundtrack. It’s sad and amazing and so emotional. When I received the Dear Evan Hansen novelization from Pajiba Krampus Exchange, I was excited for more insight into a show that I’ve only heard in song form (And once I decided I wanted to know what the song “Words Fail” looked like on stage and looked it up on YouTube and it was a mistake, I cried, it was traumatizing). Dear Evan Hansen is a story based upon a lie. Evan is a normal kid, a little overlooked and a lot anxious. His mom is a nurse and enrolled in night classes, so she doesn’t have a lot of time to spend with him, but she tries. She tries a little too hard sometimes, but Evan can be hard on her. Evan’s dad lives far away and is busy with his new wife and a new son on the way. Evan is starting his junior year of high school with zero expectations and a newly broken arm from his internship at the local park- he climbed a tree and fell out of the tree. Evan’s therapist gives him an assignment to write letters to himself as a way to get to know his mindset. They always start “Dear Evan Hansen.” One day, Evan is printing out a letter at school to take to his appointment when Connor Murphy takes it from him. Connor is an angry young man, and a bit of a burnout. In the letter, Evan mentioned Connor’s sister Zoe, Evan’s crush, and thought Evan was trying to make fun of him. Connor runs off with the letter, and Evan panics. He doesn’t know what Connor plans to do with the letter, but he knows it won’t be good. All that worry was for nothing, because the next day is normal. Connor isn’t even at school, and neither is Zoe. They don’t show up for several days, and then Evan gets called into the principal’s office. Connor and Zoe’s parents want to tell him in person that Connor killed himself. They found Evan’s letter on him, a letter addressed “Dear Evan Hansen” that concludes with “Your best friend.” Evan tries to tell them that Connor wasn’t his friend, that he was the one who wrote the letter. They don’t listen, especially when they see Connor’s name on his cast. Evan still wants to clear the whole thing up, but he eventually sees that by continuing he can give the Murphys some comfort. He asks his (family) friend Jared to help write some emails that establish Evan and Connor’s secret friendship. He makes up a story where they were at an old apple orchard when Evan broke his arm, that Connor was the one who found him after he fell. Soon, overachiever Alana urges Evan to start the Connor Project, a website in Connor’s memory. They plan a fundraiser to reopen the orchard as a memorial. Evan’s life ends up improving quite a bit because of the lie. He starts dating Zoe. He doesn’t need his anxiety meds any more. The Murphys even offer to pay for his college tuition, though Evan’s mom refuses. In fact, she is surprised to hear about Evan and Connor’s friendship. Evan has been lying to so many people for so long that it just can’t last, and won’t end well, no matter how good his intentions were. 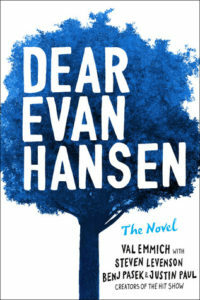 I really enjoyed the novelization of Dear Evan Hansen, though I thought it might be unnecessary. I’ve heard the songs, so I thought I knew basically the whole story, but there was more the songs don’t tell you- more story, plus some insights from Connor’s ghost. I very much hope to actually see the entire show live someday. This book was almost as good as seeing the show, and made me cry almost as much too. You can visit my review in its natural habitat here. Well congratulations, you’ve made me obsessed with this musical as well! It’s sooo good!